New Delhi : Bhartiya Divyang Sansthan (Indian Specially Abled Foundation) will hold a press conference on Thursday to draw the attention of the government towards the struggles of the differently abled. Prime Minister Narendra Modi's effort has ensured that people with disabilities being called 'Divyang'. As per the 2011 Census, there were around 12 crore people in the country with physical disabilities. In order to draw the attention of the administration towards the problems faced by such people, renowned Divyang volunteer and president of Bhartiya Divyang Sansthan, Amit Kumar, will address the media persons on Thursday (March 7). Amit Kumar, who has done a lot of work towards the well being of Specially Challenged people, will be interacting with the members of the media at Press Club of India at 12 noon. 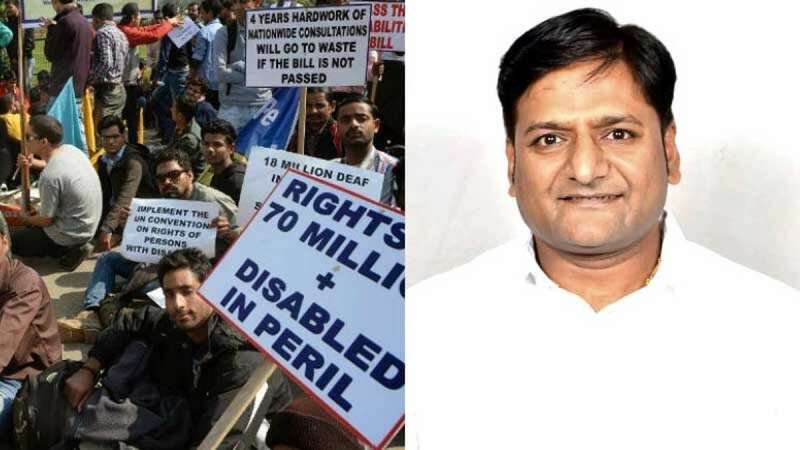 Amit Kumar firmly believes that the governments have always made schemes for improving the lives of the specially-challenged people but most of them were restricted to the files and never reached the surface. However, the Modi government has done a lot of positive work towards the upliftment of the specially-challenged people, but there's still a lot of work needs to be done. As per Amit Kumar, the general elections are approaching and there is a margin difference of voter per cent between the winning and losing party. Therefore, these 12 crore specially-challenged voters could really make a difference for any party. He further added that earlier people did not give respect to the people with disabilities they deserved. But Divyang people have shown tremendous skills and character and have even performed better than the normal beings because God gifts them with something extra when he takes something away from them. Amit demands that pension must be given to the Divyang people depending upon the degree of disability. Only Divyang people must be hired at the government and private jobs suiting them. The seats vacated by a Divyang must be awarded to the skilled Divyang candidate. Their education from primary to graduation must be made free, free transport and free medical facilities. On an economic basis, Divyang should be given ration every month, all political parties must give tickets to at least two disabled people. They should not be treated like beggars for they are demanding what is rightfully theirs.